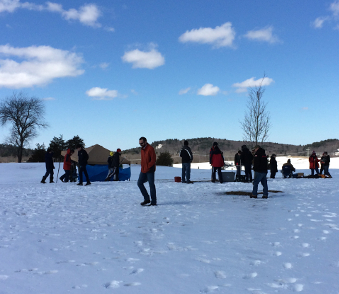 It was a beautiful winter day in Amesbury Saturday, March 18, as CMASS held a launch exclusively for high school students competing in the national Team America Rocketry Challenge (TARC). It was sunny, only occasionally breezy, above freezing, and the snow on the field was often less than a foot deep. We had six teams in attendance. Most made practice flights but two teams, Pilgrim Civil Air Patrol and Westborough High, made all three of their qualification flights. None of the qualification flights were DQed; it remains to be seen how competitive their scores will be. Also flying were Fairhaven Rec Center, Hanscom Civil Air Patrol, Lexington High, and Wavelet Technologies. Alan Swanson brought his mighty toboggan, which was essential for hauling equipment out to the launch site over the snowy drifts. In addition to Alan, usual suspects Bob, Claude, Guy, Boris and Kenn helped with the launch. Making his first TARC appearance, at LCO no less, until the chill chased him back to his car for warmer gear, was CMASS founding member and official historian Ron Q. Post launch review was held at the Flatbread Co. in downtown Amesbury. The second and final TARC launch will be held on April Fools Day (no kidding).